Gadget Dad loves the summer, lots of time spent in the garden, sitting in the sunshine. What he doesn't enjoy is all the cleaning jobs which pop up over the summer to keep the outside looking sparkling. He's been trying the Auto Washer from www.savewatersavemoney.co.uk to see if it made life easier. With the summer now very much here, as man of the house it's my job to make all the toys and things used in the summer ready for use. After a winter spent in the shed, the patio table and chairs, as well as the garden toys can be dusty and less than nice to use. I usually clean them with a cloth and soapy water, but its not much fun trying to clean the barbecue out this way. The Auto Washer did make it easier in that I didn't have to get my hands dirty, and I could fill it up with very hot water and soap and I didn't have to keep re filling it. The idea of he washer is to use less water and thus be environmentally friendly, and this is certainly the case. It carries 12 litres of water, but is very easy to carry about the garden. If you have a small garden, then this may be even easier as the hose is very long indeed. There are also variable jets of water so you can use either a light mist spray (perfect for a sly session of a water fight with the kids!) or a powerful jet spray. It doesn't just have to be used for cleaning though- I found it made the task of watering the plants and hanging baskets much easier in the garden. One job I found it great at tackling was the bottom of the paddling pool. After a raining few days in the last few weeks, there was water left in the bottom. Inevitably, with the rain and leaves which fell in, the bottom soon resembled the bottom of a pond, with thick green gunk all over. 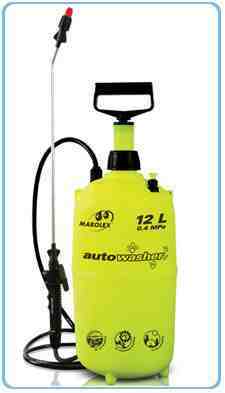 The Auto Washer easily removed the muck with a lot less hassle. If I hadn't of had the Auto Washer I think the pool would have gone in the "Shed of no return" and replaced, so it has saved me not just time and effort, but money too. The only negative I've found is that I had to keep pumping the handle if I wanted to build up enough pressure for the tougher jobs, which does tire you out after a while. Something which I believe is worth owning for light jobs like washing the car and as I've used it in the garden for light cleaning. Cool! I never knew that there is a hand pump pressure washer. I also want to try that. Thanks for sharing.